t*rexes and tiaras: Sunday Shoes 098.. 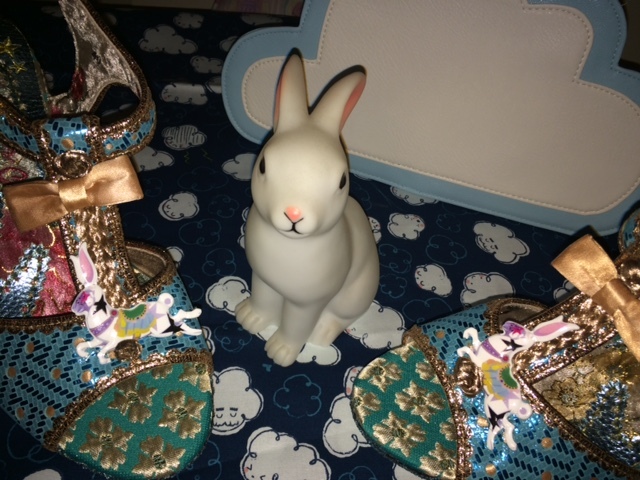 I managed to take advantage of the Irregular Choice mega sale last week by ordering this pair of Nimbus heels. I'll admit that when these first launched, they totally passed me by. In fact, it was only recently when I saw someone's pair on Instagram that I even noticed these. There is just so much detail in this pair that I'm not sure where to begin, so it's no wonder they were released as part of the "Gold Star" collection. The main fabric on the upper of the sandal is a textured (almost jacquard?) blue with dashed print, but also with gold metallic polka dots across it. All of the straps are finished in a sparkly gold braid, which adds to the opulent effect. 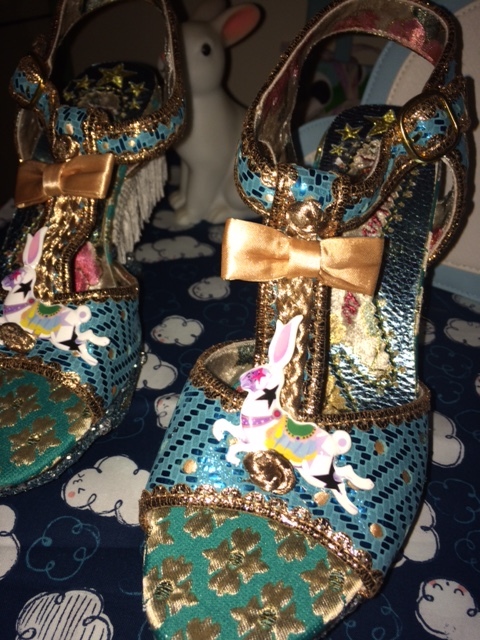 More gold can be found on the fronts of the sandals which boast bows and a piece of gold rope, which is home to the carousel rabbit charm. The name of the shoe, Nimbus, obviously makes me think of clouds, so perhaps it's a cloud carousel. 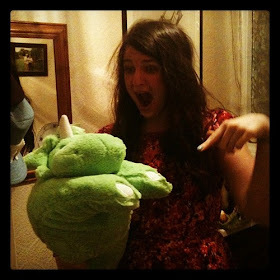 Stranger things have happened! Onto the backs of the sandals and you can see they are adorned with a tassel fringe. 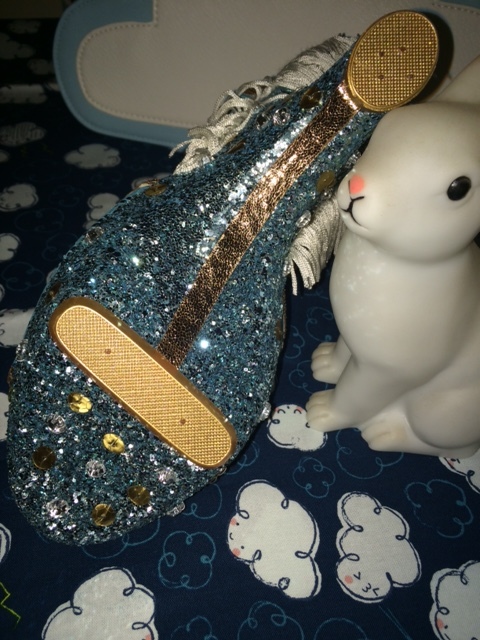 The bottom half of the shoe is pretty much entirely covered in glitter and the heel is reminiscent of the inverted heel on styles such as Prom Princess and Izzy Bear. The soles of these sandals are quite possibly the most quirky element of all. It's not quite a sole, more a tiny strip of sole under the front platform which is a kind of diamond shape. Oddly, they're still pretty comfortable to walk in and feel totally stable. I really like the photos you took! The cloud background and bunny was inspired! 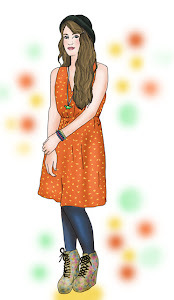 Thanks - that cloud fabric will be a dress when I get some time at home! I was the same, they kinda intrigued me, but were a bit too crazy for me at first. 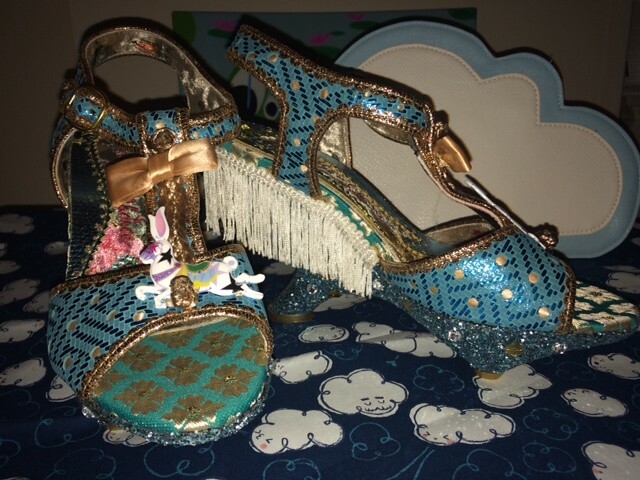 I'm really pleased I got mine though (Billows), the lack of sole is strange, the heel shape though has never bothered me (like you say we have so many of the similar ones like Izzy) and the glitter, fringing etc is over the top, but oh so IC! I know, it's all such a wonderful mish-mash!